The Dalles of the St. Croix River, which separates Minnesota and Wisconsin. 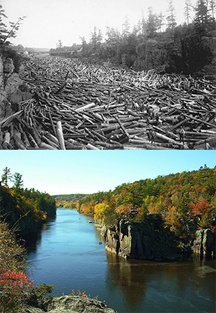 The upper photo shows just a small part of a monumental two-mile-long logjam, which occurred in 1886. The lower photo is a modern view. Between 1837 and 1912, local loggers used the river as a transportation channel for timber cut during the winter. When the river cleared of ice, the logs were dumped into the river for transport to sawmills in Stillwater, Minnesota. Just below the Dalles, the river takes a sharp turn, which repeatedly caused logjams. By exporting trouble upstream, critical-path tasks can create logjams in projects. Those jams help to relieve the political pressure on tasks downstream in the critical path. Lower photo courtesy Wikipedia. Upper photo courtesy Minnesota Historical Society and the U.S. National Park Service. Usually we regard the critical path as future-oriented, including only incomplete tasks. But if CP is a critical-path task, depending on a completed task C, C can suddenly find itself in the critical path. Here are some insights that help us understand the politics of the most common situations. CP, one of the consumers of C's deliverables, might suddenly discover a problem with C's deliverables. Since CP is in the critical path, it's probably experiencing pressure. By asserting that the problem lies in C, rather than CP, some of that pressure is relieved, at least temporarily. Notice the sources of claims that C's deliverables are deficient. If the source lies in the critical path, investigate the evidence for those claims especially carefully. Sometimes, troubles in a dependent task CP lead to decisions to solve the problem by reaching back to the completed task C and demanding changes. Shipping the trouble upstream in this way requires political clout, but it does happen. The pressure of the critical path is a common motivation for shipping trouble upstream. CP might have multiple issues. By exporting some of them, CP gains time and resources to address other issues. The intention isn't necessarily malevolent (though it can be), but as time passes, the temptation to use the excuse that "C hasn't yet fixed its deliverable" can be irresistible. C can often defend itself from such actions by making the cost of rework explicit. When requirements change, they sometimes affect work already completed. If C's deliverables no longer meet requirements, C can suddenly find itself in the critical path, even if it was considered complete under the old requirements. Maintain vigilance over requirements that pertain to completed tasks. Changing them is usually expensive. Constituencies with interests in critical-path tasks, seeking to avoid rework in their own tasks, sometimes exert pressure to change requirements that affect already-completed tasks. for shipping trouble upstreamcritical-path task CP starts using C's deliverables. In some political environments, CP might insist that C "fix" its deliverable, even though it met the original completion criteria. Careful review of all completion criteria can reduce the probability of this happening, and close cooperation between C and CP can sometimes uncover completion criteria defects before C's work is complete. This is especially important when C and CP are executed at different locations or by different organizations. Would you like to see your comments posted here? rbrenTEWsvUvglpOKkXZPner@ChacPkokfghVLecLlsBUoCanyon.comSend me your comments by email, or by Web form. I offer email and telephone coaching at both corporate and individual rates. Contact Rick for details at rbrenNtgRwcvyKIltEcFUner@ChacUKwYspfeZbGaIeEmoCanyon.com or (650) 787-6475, or toll-free in the continental US at (866) 378-5470.